Looking to add some vintage charm to your home? 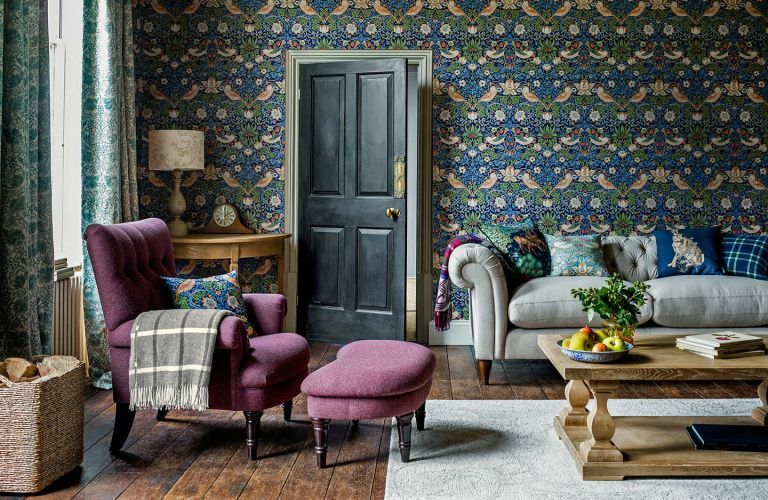 Adding Arts & Crafts design ideas through period-style prints, whether in the form of wallpaper, upholstery or accessories, can be a really quick and easy way to add plenty of character to a space. With a penchant for ornament, the Victorians used every surface as a vehicle for decoration and often pasted richly decorative papers floor to ceiling. Featuring one of Morris & Co’s most iconic Arts & Crafts designs dating to 1883, this Strawberry Thief wallpaper is a perfect backdrop for the curvaceous silhouette of a classic Chesterfield and deep-buttoned armchair. Using a feature archive wallpaper as inspiration, updated in a fresh palette, choose cushions and upholstery in bold complimentary hues to give the Arts & Crafts look a contemporary edge. Give guests a stylish welcome by pasting up feature wallpaper in the hallway. Depicting Persian style flowers climbing an overblown botanical trail this Montreal design was created by John Henry Dearle in the 1890s and was originally designed as a carpet. Bringing the Morris legacy into the 21st-century bedroom, archive prints are also available across bedlinen, including Pink Rose, an updated version of an original William Morris print from 1890, which brings colour and pattern to this muted scheme. For an authentic feel combine stylised prints with wood panelling as often seen in Arts & Crafts interiors of the time. This Pimpernel wallpaper was designed in 1876 by Morris and adorns his dining room at Kelmscott House in Hammersmith, London. Using colour for continuity, layer exuberant natural prints with simple ditsy and contrasting bolder designs to create a rich, textured look. This Marguerite wallpaper from Nina Campbell has similar tones the sofa but the more graphic print and vibrant colours of the upholstery stop the look being too matchy matchy. Make a feature of your windows (and doors) in true period style with heavy curtains in richly ornate fabric. These curtains have been made using Pure Brer Rabbit Print Linen, and we actually love how to the traditional, quite busy, print looks in this minimalist space. As well as across wallpapers, fabrics and bedding, the decorative motifs of Morris & Co. are now available in a range of home furnishings. Check out this gorgeous Bachelors Button rug , paired with simple furniture and rustic touches. Love it! Archive wallpapers depicting a rich tapestry of natural motifs, work perfectly in this traditional kitchen, combined with vintage cabinets, natural fibres and artisan ceramics. Taken from the archive at the Whitworth Art Gallery in Manchester this Vine wallpaper, dating to 1932, gives an unmistakeable nod to the Arts & Crafts movement. A deep-cushioned seat covered in the blousy blooms and stylised branches of Arts & Crafts prints makes for a sumptuous statement piece. We especially love the pops of colour in the piping of this sofa that has been upholstered in Celia Birtwell's Jacobean Medieval by Blendworth. Incorporating Arts & Crafts prints doesn't mean you have to go all out and cover every wall, floor, window and sofa in traditional designs. Just check out this room – Pure Thistle wallpaper by Morris & Co. has been used to add a feature wall and combined with the Scandi-style furniture and the accents of black, this space actually looks super modern. Want more decorating advice for period properties?